Blue Ribbon Cookbooks for Sale! 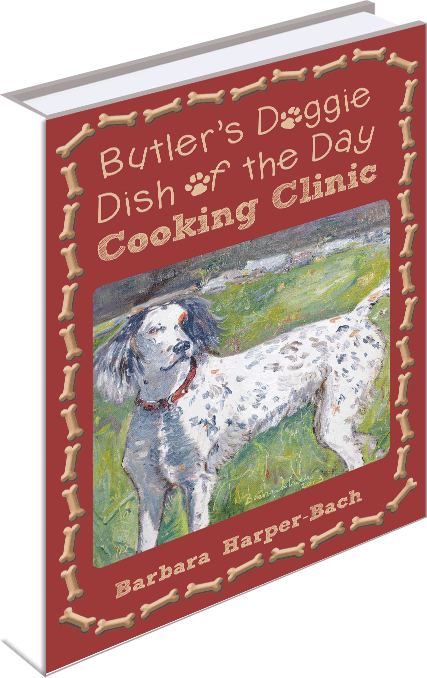 Barbara Harper-Bach is a well known, blue-ribbon cook and artist who has recently published twelve cookbooks. Meatloaf Mania Cooking Clinic. 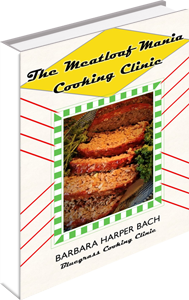 The meatloaf cookbook is a lifetime collection of my best meatloaf recipes and some tweaked to become meatloaf burgers, stove top meatloaf, meatloaf sliders and more, including recipes from two local top chefs in the bluegrass and other friends. A Kentucky Book Fair cookbook 2018. Only $14.00! 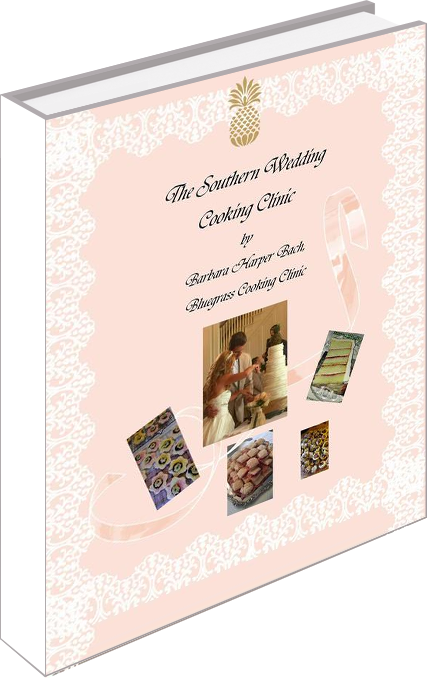 The Southern Wedding Cooking Clinic, Around 250 pages of recipes and menus for engagement parties, wedding showers, bridesmaids luncheons, sweetheart luncheons, rehearsal dinner and many different themed wedding receptions. The only cookbook of this kind on the market to our knowledge. Color photos of my daughter’s 2016 wedding and photos of many recipes in center fold. Large print. Will be available by March 15 for $32.00. Preorders are welcome! The Irish American Cookery Clinic, 167 pages, $25.00. Available Now! 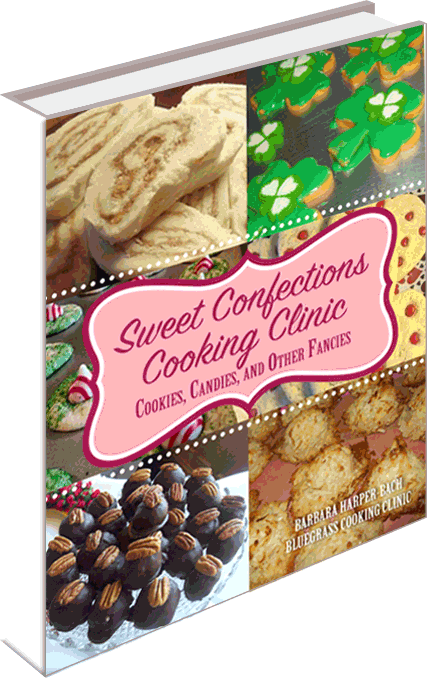 The Sweet Confections Cooking Clinic, 189 pages, photos, $28.00 accepted in this year’s Kentucky Book Fair as an outstanding cookbook of 2015. Available Now! 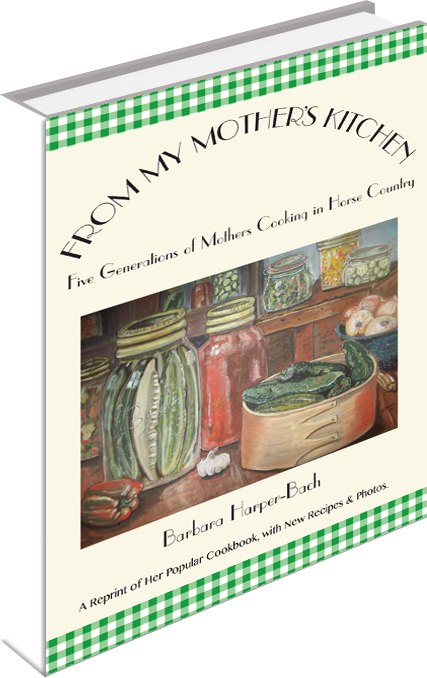 From My Mother’s Kitchen has been reprinted from the 2008 edition with photographs and some new recipes added, this book is a nostalgic collection of Barbara’s mother and grandmother’s best recipes including recipes from some of her friend’s moms as a bonus. $28.00. Available Now! 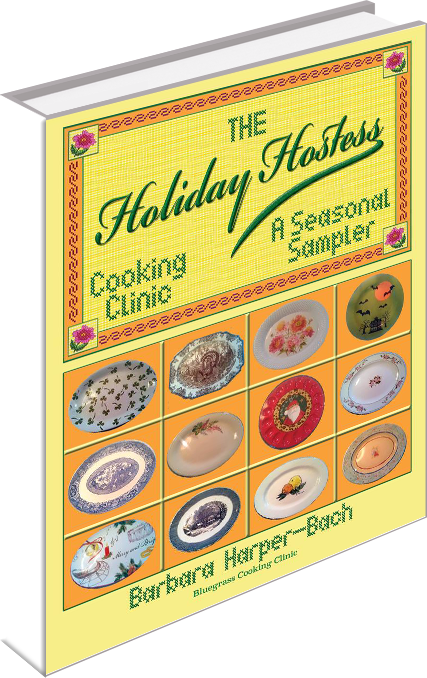 “The Holiday Hostess Cooking Clinic, A Seasonal Sampler“, 300 pages of monthly menus, special occasions and recipes galore with more photographs and illustrations than ever before. $38.00. “The Derby Party Cooking Clinic” cookbook, 120 pages. The book is a stellar collection of unique Derby recipes from award winning horsewoman, artist and cook, Barbara Harper-Bach and area Derby Host/Hostesses to make your Derby Party as exciting as the Kentucky Derby itself. Ideas for decorating and games are included with color photographs throughout. The horsey set will be delighted with sections like “The Watering Trough” (Beverages) and “Sweetfeed” (Desserts). A must for this year’s Derby celebration and for years to come. Barbara’s oil on canvas print of her 2013 Kentucky Derby Poster entry adorns the cover and she has done horsey illustrations for each section. “The Pat-A-Cake Clinic” cookbook is 200 pages of mouth watering recipes for biscuits, breads, coffee cakes, pancakes ,yeast rolls, and heirloom cakes, including Angelica Guica’s (Teodora’s) Artisan bread. Chef Candido’s Tutti Fruitti Cake of Celebrity Cruise Lines, and Anita Madden’s wonderful cook Virginia Shelby ‘s Cheese Bread and as a bonus many great recipes for accompaniments and side dishes. The book sells for $42.00 and will be available at local book stores and boutiques and, of course, here on my website. 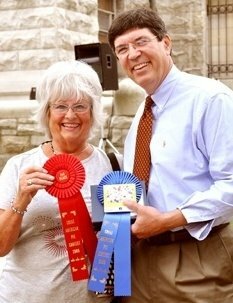 “The Pure Kentucky Pie Clinic” cookbook is 145 pages of the best collection of pie recipes in the world, many being award winners. Won third place in the Georgetown pie contest with my apple butter pie in Feb. 2012. 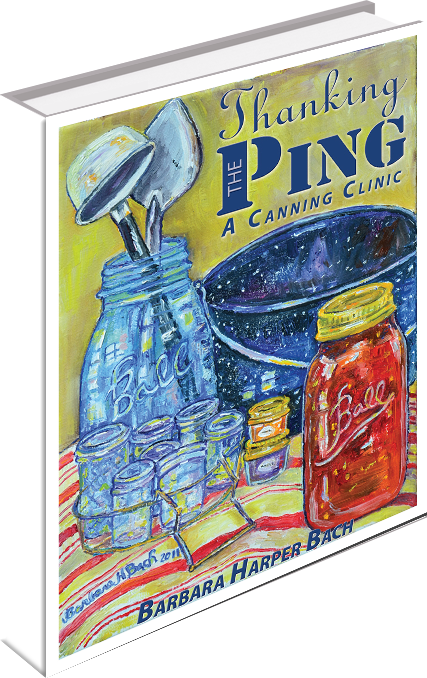 “Thanking The Ping” The Canning Clinic Cookbook teaches the reader the lost art of canning and preserving and includes recipes for the condiments as well as recipes that use home canned goods. As usual, Barbara includes a good read in the text of this 140+ page cookbook, with stories about family and friends in connection with almost every recipe. Barbara is busy preparing for “IGA Meals in Minutes (two television shows based on recipes from the new book. TV station WBKO in Bowling Green, KY will be airing those shows. 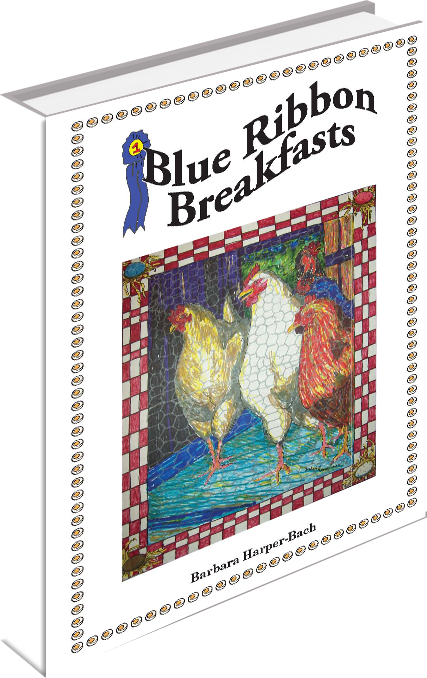 Blue Ribbon Breakfasts is a collection of the recipes that Barbara’s Blue Ribbon Breakfast committee used when they cooked for a Men’s Prayer Breakfast at Anchor Baptist Church in Lexington, Ky. The women prepared breakfast once a month for almost year for 32 hungry church men and when the leader of the group died, the breakfasts were discontinued. The book is dedicated to the leader, Jack Adcock and proceeds from the book will be donated to the church in his name. This book contains amazing recipes for wonderful country breakfasts and brunches with lots of eggy dishes suitable for spring and Easter feasting. Blue Ribbon Breakfasts is $20.00 plus $5.00 shipping. The first, The New Turkey Clinic is a “how to” on conquering Thanksgiving by staying ahead of the game for the new Thanksgiving cook. It is a small, ten page booklet that is packed with information. 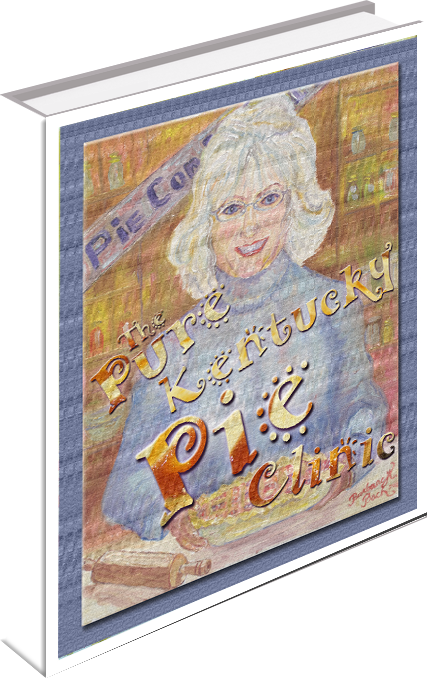 Included in this book are her two winning pie recipes from last year’s Great American Pie Contest in downtown Lexington’s Fourth of July festivities in which she won first and second place out of fifty five pies. This cookbook is $12.00 plus $5.00 shipping. 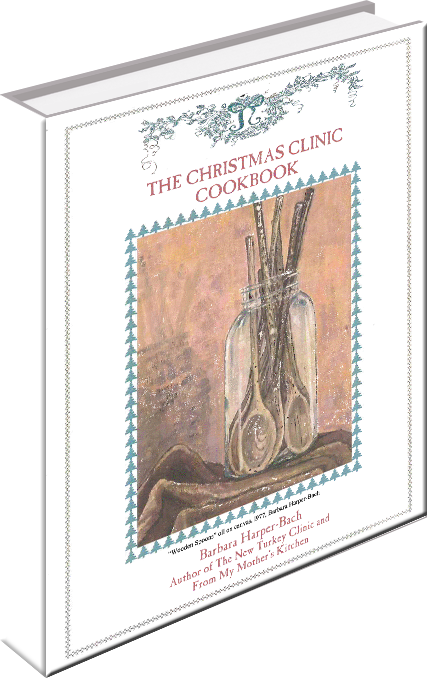 The next book “The Christmas Clinic Cookbook“, $22.00, contains every recipe you will need for Christmas and is divided into two parts: the sideboard which contains recipes for all the gift giving and family that can be made ahead beginning the day after Thanksgiving with the traditional fruitcake that needs to be basted every day until Christmas with a good Liquor, and the Christmas Table that includes recipes and instructions for elegant holiday feasting from Christmas luncheons to Christmas day dinner. Her second passion as an artist enables her to illustrate her own books. They are paperback books that she self publishes. 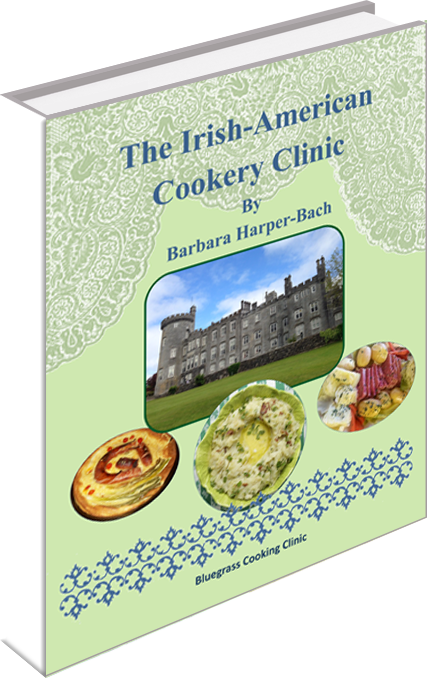 This Clinic promotes her cookbooks that are instructional and a collection of Irish family heirloom recipes. She is an award winning cook (first and second in Lexington’s Great American Pie Contest 2009) and an award winning artist who does the artwork, typing and publishing of these books. Click here for an order form to mail with your check or money order.